Sick of dealing with nasty breakouts, painful pimples, and the scars and discolored spots associated with the aftermath of acne? It’s no secret that nearly everyone is forced to battle with acne at some point in their lives. No matter if it’s during your teen years when you’re first experiencing puberty or, even more embarrassingly, when you’re an adult, it’s a difficult fight. That’s where the Obagi CLENZIderm system comes into play. The crowning jewel of Obagi’s skincare lineup, CLENZIderm is clinically proven to begin reducing acne as quickly as one week after beginning use of it. This system is designed to penetrate into the deepest layers of your skin to get rid of adult acne, fight back future breakouts, and clear-up the skin. This means it’s capable of getting rid of already-present pimples, blackheads, and whiteheads, and will also diminish any scarring, discoloration, or craters that occur because of the acne. 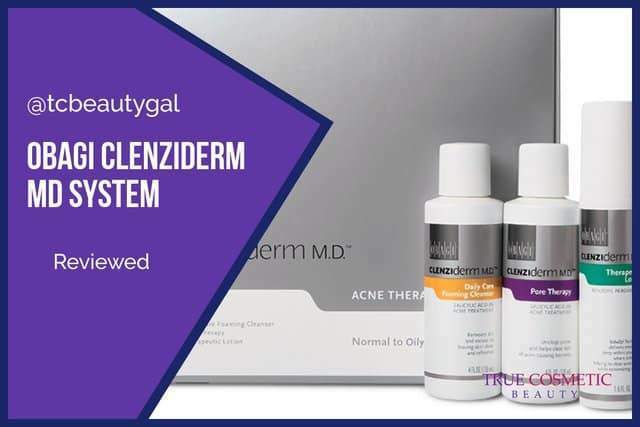 CLENZIderm MD comes in two varieties: a normal to dry system for individuals with regular or dry skin types, and a normal to oily variant that is best suited for people with normal to oily skin types. Using the correct system is critical to the success you’ll see from using this product. Both versions of CLENZIderm consist of a 3-step acne treatment. Both feature products that essentially do the same job but are custom-tailored slightly depending on what your skin type is. The formula of these products is specially made for people with normal to dry skin types. For further details including a full review, consumer opinions, a breakdown of ingredients, and more for each of these products simply click on the associated links above. These links will take you to pages with a lot more info. Does it work? That’s usually the first question out of anyone’s mouth when thinking about buying any kind of skincare system. The problem is that you’re often asking a sales associate or a spa worker these questions. 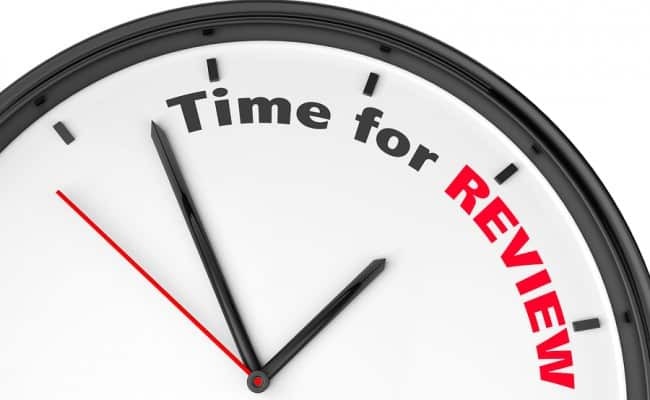 And, of course they’re going to give a glowing review, they’re trying to make a commission! As seen above, most people agree that Obagi CLENZIderm is one of the best solutions for adult acne available. Many women claimed that it completely eradicated acne that they had been dealing with for many years. And these women are 30, 32, even 40 and older. A few people did claim, however, that some of the steps to the system were a little harsh on the skin. So, if you’ve got very sensitive skin you may run into some mild irritation when using these products. Others also said that it sometimes left their skin too dried out and a little flaky at times. This is most likely to occur with individuals with extremely dry skin. Words and stats only paint a portion of the picture. 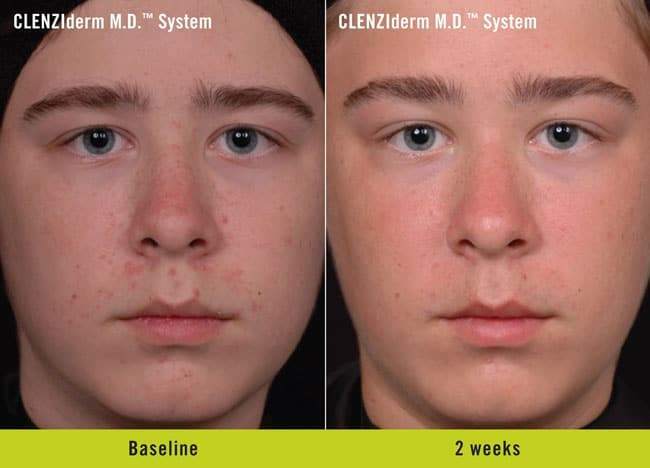 In order to really understand how well the CLENZIderm system works for getting rid of acne you’e got to see real results. Below are some before and after photos of individuals that have actually used this system to treat their acne. 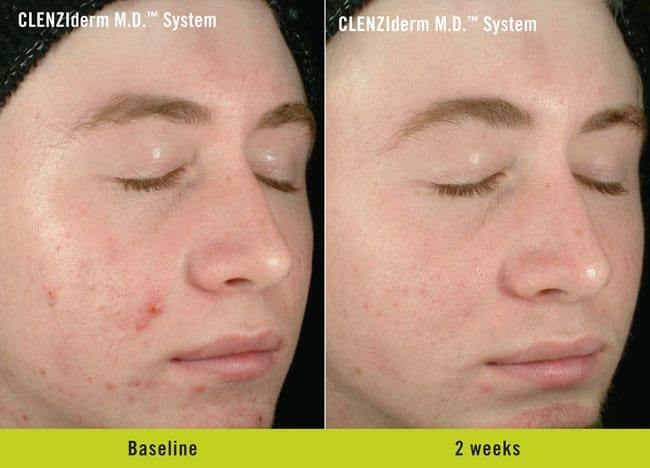 As you can see, these individuals saw great results while using CLENZIderm. Perhaps even more interesting is that these results were achieved after just 2 weeks of use. With a month to two months of daily use these people could potentially see even more improvements in their skin. 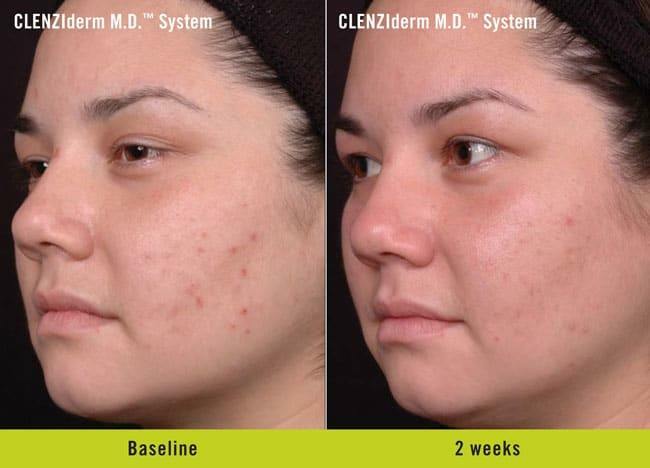 Overall, Obagi has hit a home-run with the CLENZIderm MD system. It’s definitely one of the most effective and fast-working acne treatments available. While it’s not really meant for teens, it works wonders on unnerving adult acne. Our main disappointments with it are that it isn’t really effective at treating cystic acne, but, then again, not much is. Cystic acne is often caused by hormone imbalances which can be very difficult to manage. The other thing is that the system can be a bit rough on your skin if you have a sensitive skin type. It’s tolerable, but does cause a little discomfort at times. Despite the fact that this product comes from a highly reputable cosmetics provider, it’s still important that you know what it is that you’re putting on your face. You should always do your homework and learn about the various substances found in your cosmetics no matter what you’re buying. If you are allergic to any of the substances listed above or have had an incident with other cosmetics that contained any of these ingredients you may want to consider looking at an alternative home acne solution. As mentioned above, CLENZIderm MD is a three-step system. Using the official regimen daily has been proven to greatly improve the appearance of the skin, get rid of nasty acne, and help promote the development of new, healthy skin cells. 1. Wet face using lukewarm water. Use a small amount of the Daily Care Foaming Cleanser and massage it all over the face for roughly half a minute. DO NOT get the product in your eyes. Rinse off your face well and then gently pat it dry. 2. 15 minutes after using the Foaming Cleanser you’ll want to take a cotton ball and get it wet with the Pore Therapy product. Rub the ball all over the face. DO NOT get the product around your eyes, nose, or mouth. Wait for this solution to air dry. DO NOT rinse it off. 3. Once the Pore Therapy has fully dried you’ll want to use one pump of Therapeutic Lotion. Massage it into the skin all over the face without getting it around your eyes, nose, or mouth. Wash hands, but DO NOT rinse the lotion off. 1. Wet your face with lukewarm water. Use a small amount of the Daily Care Cream Cleanser and rub it all over your face without getting it in your eyes. Rinse the cleanser off well and then gently pat your skin dry. 2. 10 minutes after the cleanser has completely dried on your face you’ll want to use just one pump of Therapeutic Lotion. Massage it evenly all over your face without getting it near your eyes, nose, or mouth. You’ll want to wash your hands well after use but DO NOT wash the lotion off of your face. 3. 5 minutes after applying the lotion you’ll want to use the Therapeutic Moisturizer. Massage a small amount of it all over your face, avoiding contact with eyes, nose, or mouth. For both systems you’ll also want to apply a broad-spectrum sunscreen, such as Obagi Sun Shield, to protect your skin from damaging UVA and UVB rays that you’ll encounter outside. This is a highly recommended step. 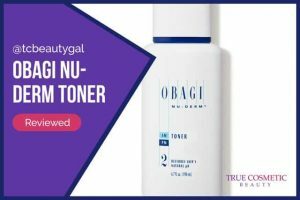 Looking to buy the Obagi CLENZIderm system for yourself and start repairing, rebuilding, and beautifying your skin? Awesome! We highly recommend trying this acne treatment. You’ll want to make sure to purchase the version that best suits your personal skin type. IMPORTANT: Before beginning use of this acne treatment, of any cosmetic product for that matter, you need to talk to your doctor or physician about it. This will ensure your safety when using products containing chemicals that may or may not be suited for use on your skin.